After successfully representing Ghana at Dakar, Senegal for the Statelessness Campaign by United Nations High Commission on Refuges (UNHCR) West Africa, the silky voiced, eShun has been elevated to the High Level Supporter for UNHCR West Africa ‘Statelessness’ campaign. This promotion will surely establish eShun as one of Ghana’s most iconic young artiste who is contributing to the growth of Africa and the world. “Your professional and personal qualities have been hugely appreciated by the UNHCR Statelessness team in Dakar. It has been a real pleasure seeing how your engagement fighting to eradicate statelessness in West Africa was captured in your voice and your music,” stated in email by an official Representative of UNCHR in Dakar, Senegal Ms. Teresa Vazquez. With an infectious innocent smile and voice she answered when asked how she feels with this advancement by thanking God for the elevation in her music career. “I am happy I can be of help to the whole West African Countries who are saddled with this rather unfortunate man-made problem”, eShun added. She further went on to disclose her intentions and ultimate hope to become ‘one of the biggest female musicians in Ghana and across the globe’”. 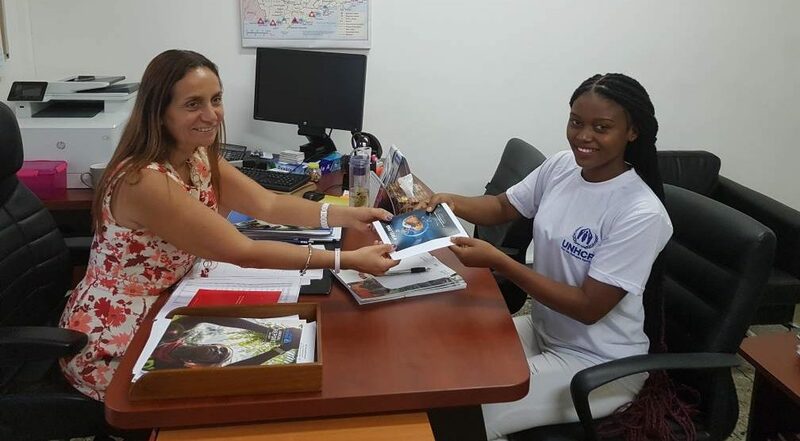 “We are happy to have eShun as a High Level Supporter of this Campaign,” said Ioli Kimyaci a Representative of UNHCR after eShun signed the forms to become High Level Support. The ‘someone loves me’ singer hinted during the interview that she will love to collaborate with the likes of Kojo Antwi, Angélique kidjo, Yvonne Chakachaka and many others. Unarguably eShun is one of the fastest growing musician in Ghana and has taken her brand to the next level since she took part in the UNCHR Statelessness project.